Resolute supports communities with significant funds! $400,000 shared between two Québec regional county municipalities (RCM), Domaine-du-Roy and Maria-Chapdelaine and $120,000 shared between the Roberval and Dolbeau-Mistassini hospital foundations and the Mashteuiatsh Centre de la Petite Enfance (a daycare centre). This funding is part of Resolute’s commitment to support two funds created by the RCMs by contributing $200,000 per year for 5 years, which gives each RCM a total of $1 million. These funds were created to help new forest products companies get started and to help existing companies expand in order to create new jobs and consolidate existing jobs in the two RCMs. Resolute has contributed $1.2 million so far. 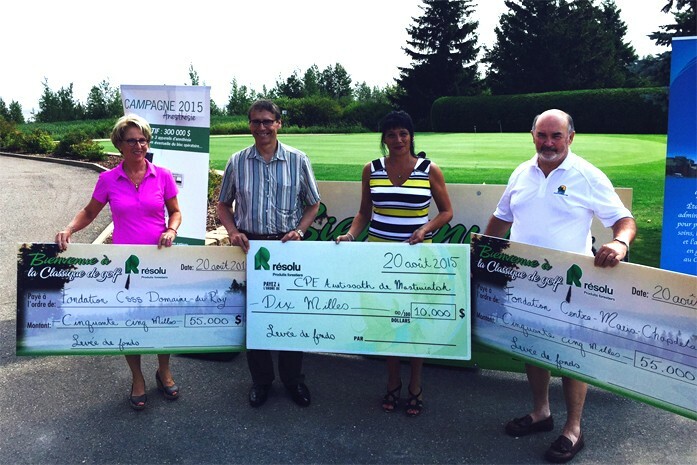 Additionally, the 2015 Resolute Golf Tournament has enabled the Company to donate $110,000 to the Dolbeau-Mistassini and Roberval hospitals to purchase equipment. The Mashteuiatsh daycare centre also received $10,000 to update its infrastructure, which will benefit more than 105 children. Jean-Pierre Boivin, Chair of the Fondation du Centre Maria-Chapdelaine, and Madeleine Leclerc, Chair of the Fondation Domaine-du-Roy, thanked Resolute and Richard Garneau for the substantial financial assistance, stating that “Resolute is an important partner and we congratulate the company for its social engagement in the region. Our foundations have to purchase and replace equipment because the need for good health care is constantly growing”.